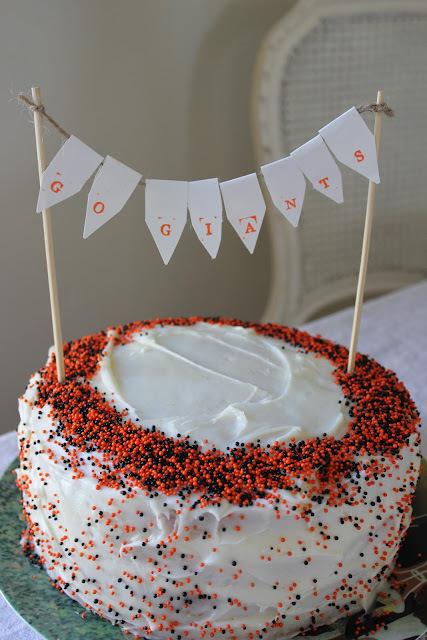 I do not claim to be a huge Giants fan. I like baseball. Many of my friends, though, who eat, breathe, and sleep orange and black. That being said, as a resident of San Francisco for over twenty years now, it is tough not to get caught up in the excitement which culminated last night when they won the World Series. So as my contribution to my friend's dinner party to watch the game, I made this cake. The inside, which I did not get any good photos of, was four layers, each one a slightly darker shade of orange. Also, my thoughts and prayers are with the people on the East Coast today. Enjoy your week and be sure to enter the giveaway for my shop at Primp. Michele, (yes, the author of the wonderful blog Primp, and I spell our names the same way) has been very kind to host it! Thank you, Michele. I love how pretty the cake turned out and the cute banner you made for it. Congrats on your win! I'm going to go check out your giveaway now. My hubby was drafted by the Giants, and the Selective Service back in the Viet Nam era. He served Uncle Sam, and never played for the Giants. 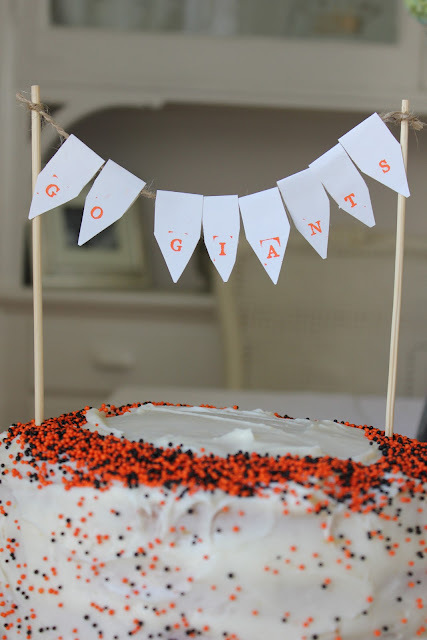 The Giants will always have their special place in our family history. We were rooting for them all the way! I LOVE your banner cakes!